You can customize Fixtech settings via "Fixtech Options". You can upload logo or change skin color etc. Here are details of each section that you can customize. You can change Layout related changes here. Like you can switch to Boxed or Wide layout, or you can select Skin color from here. You can set First Column Text . Go to Admin > Fixtech Options > Header Settings section and set the text from "InfoStack First Column Content" option. You can set second Column Text. Go to Admin > Fixtech Options > Header Settings section and set the text from "InfoStack Second Column Content" option. You can set Third Column Text. Go to Admin > Fixtech Options > Header Settings section and set the text from "InfoStack Third Column Content" option. You can set menu area height. Go to Admin > Fixtech Options > Header Settings section and set the height from "Menu area height" option. You can set Header menu background color. Go to Admin > Fixtech Options > Header Settings section and set the color from "Header Menu Background Color" option. You can set sticky header menu background color. 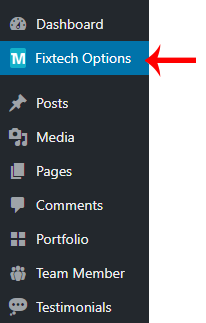 Go to Admin > Fixtech Options > Header Settings section and set the color from "Sticky Header Menu Background Color" option. First go to Admin > Fixtech Options section and go to "Under Construction Site" tab.